Don’t know about your neck of the woods, but it’s starting to feel like spring here. But since I never finished barely started all my sweatshirt projects, I want to do that right away. 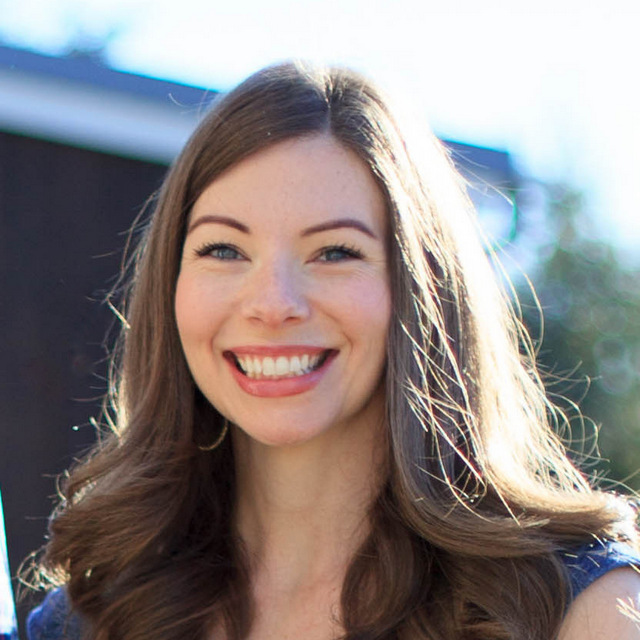 Besides, something I love about spring is starting with crisp, cool mornings, enjoying warm afternoons, and then going back to cool, breezy evenings – perfect sweatshirt weather. I’m so excited about today’s project! It’s been in my head since before Christmas. My inspiration came in the form of a Nordstrom catalog that arrived in my mailbox just after Thanksgiving. 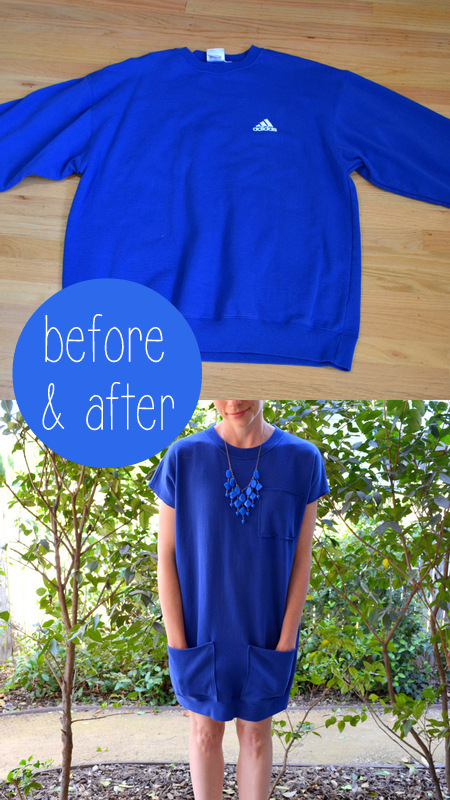 Since sweatshirts are a cinch to find at thrift stores, I set out to find the perfect one and make my own. 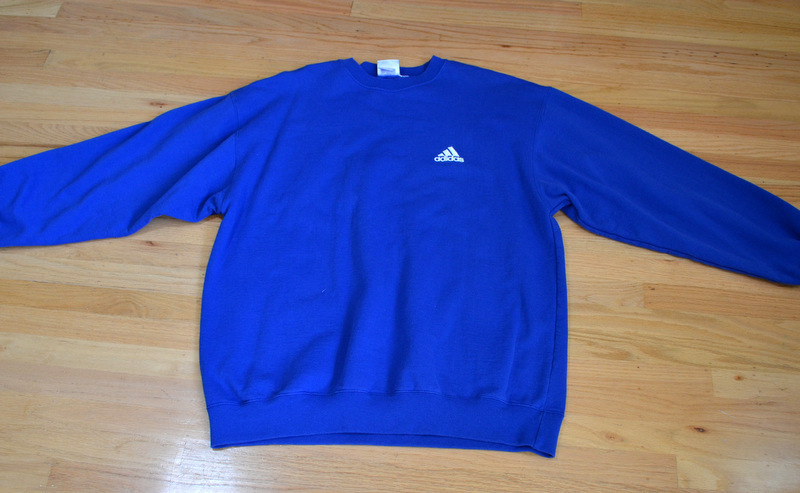 I found this great Adidas one in royal blue for a couple of dollars. It was a men’s 2XL, large enough to have enough length to make a dress. 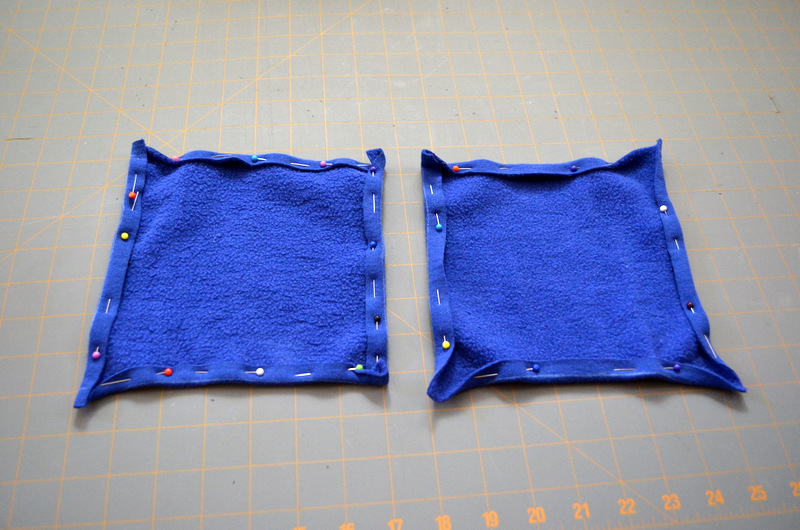 I started by chopping the arms off – no sewing, just leaving the edges raw. I saved the sleeves, and they came in handy later. 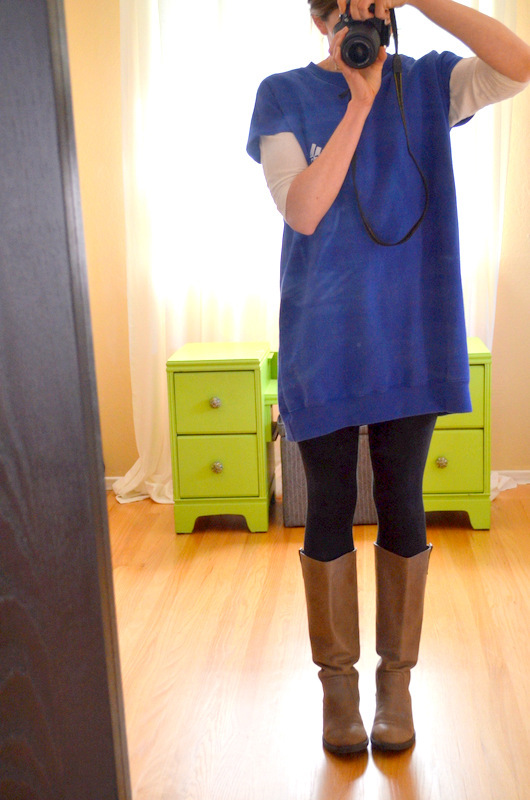 Next I tried on the “dress” and measured where to start sewing to close up the armhole to make a “sleeve”. 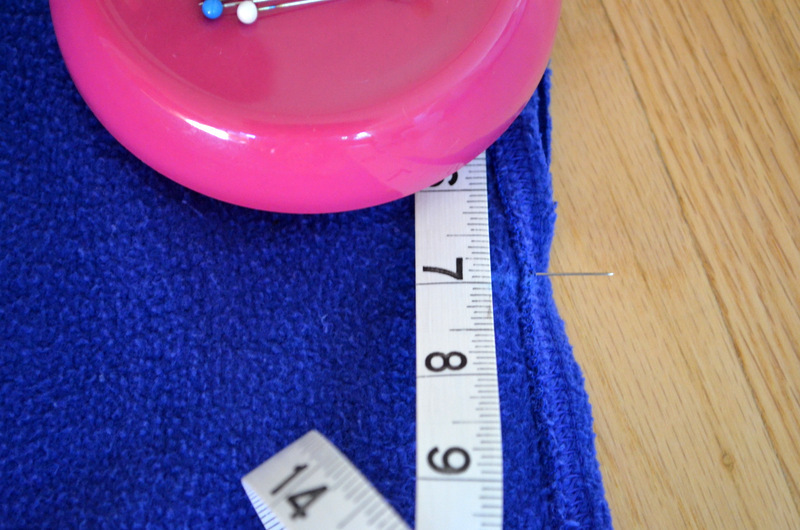 For me, it was 7 inches from the shoulder seam. I turned the shirt inside-out and pinned it at 7 inches. 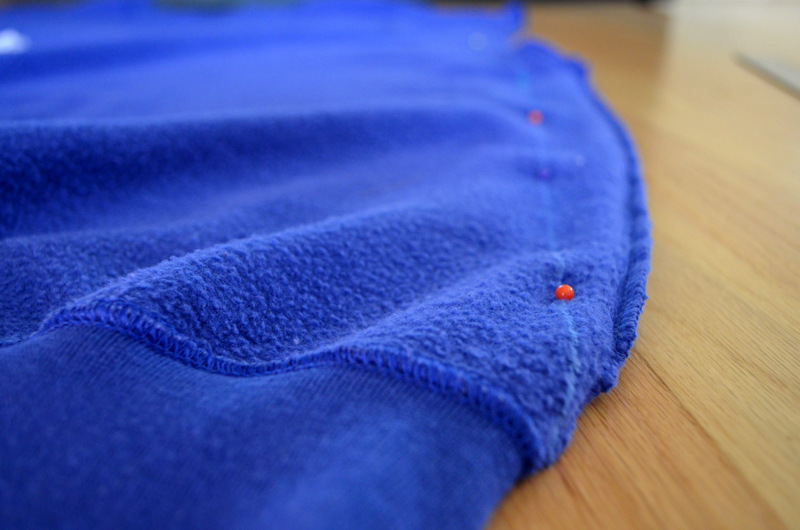 Then I used a straight edge and chalk to mark a line from that pin to the hem of the sweatshirt. 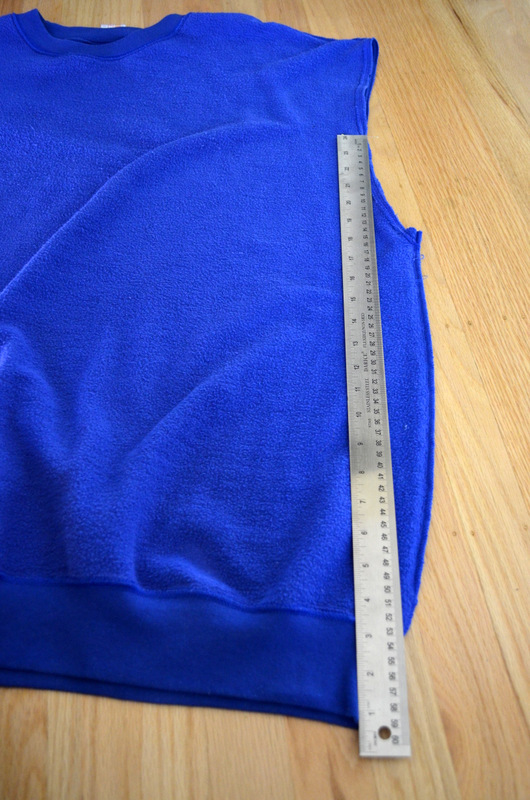 and sewed new side seams on both sides. I tried it on to determine if this was all that was needed. It wasn’t enough for me, so I decided to add some big pockets at the bottom. 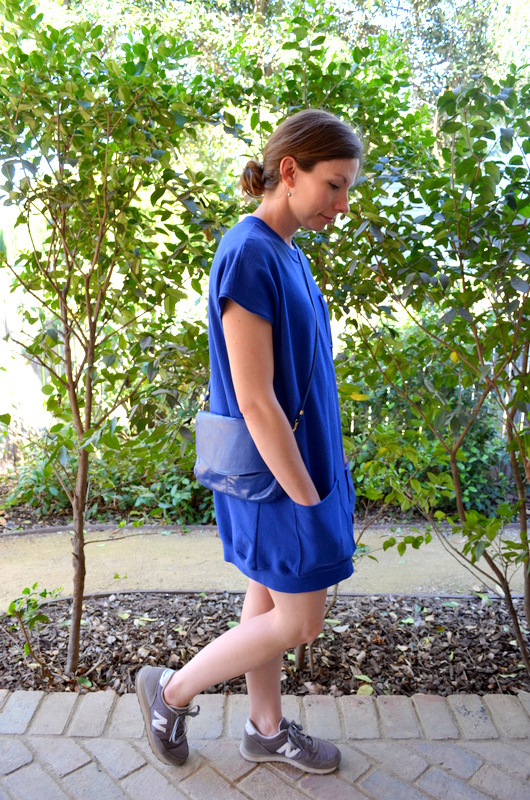 Who doesn’t love a dress with pockets? 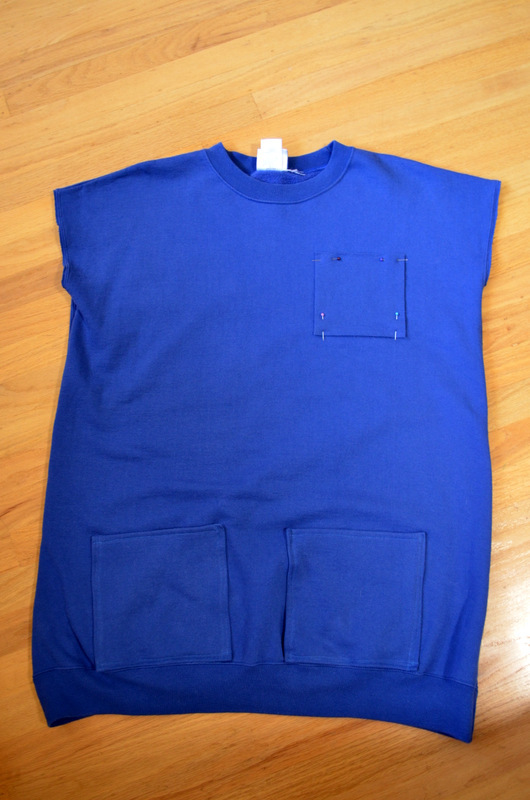 I used the parts I cut from the sleeves to create pockets. 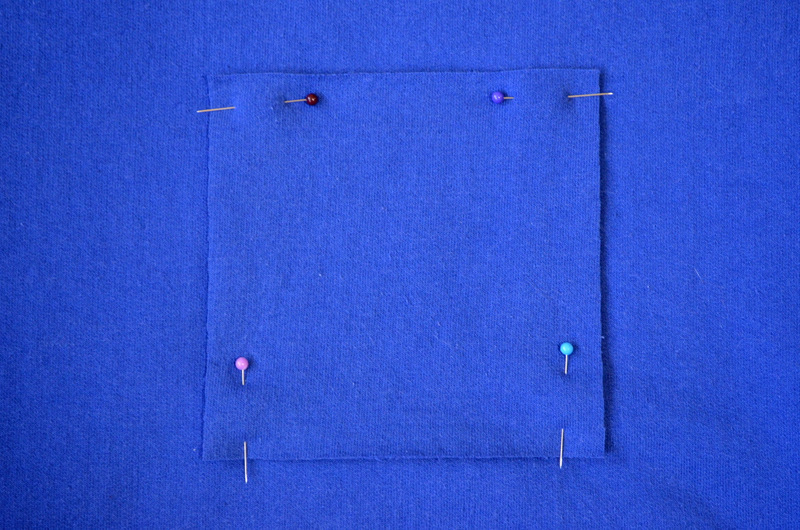 I arbitrarily decided that 7 inch square pockets would work. I cut out 8 inch squares and folded in 1/2 inch on all sides and pinned. And ironed, of course. 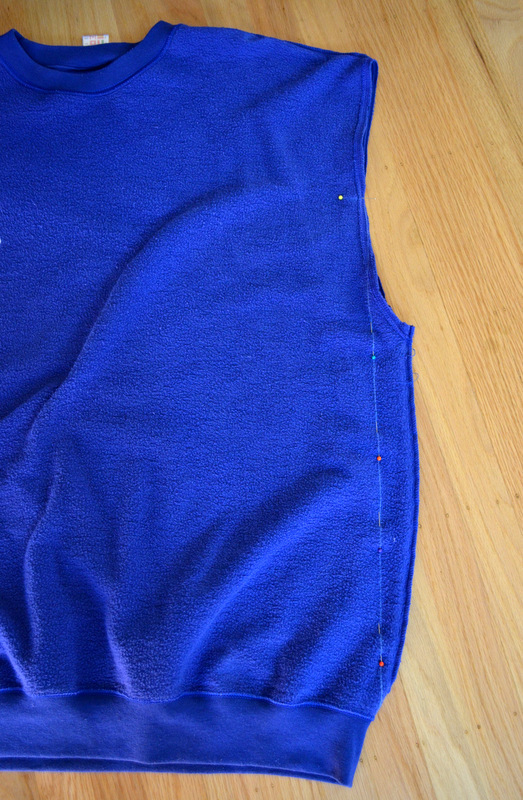 I sewed the 1/2 inch edges down first and then attached the pockets to the “dress”. I still needed to cover the Adidas logo on the chest. I am not a fan of any kind of logos or words – it’s a weird quirk I have. I tried a few things (including the leather from these boots that never turned into anything), but a small square patch of the leftover sleeves was the best. 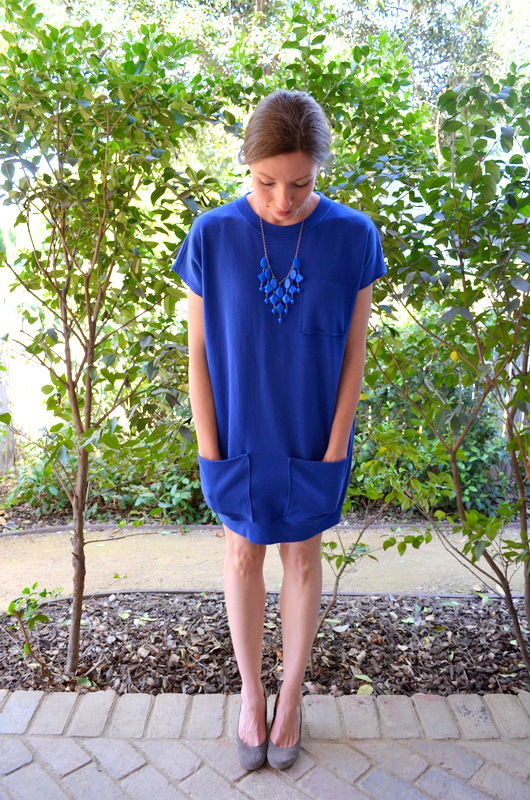 And here’s the dress (paired with my “Just Showing Up” necklace – also here). Dressed up a bit with gray wedges. The entire time I worked on this dress, I kept hearing the lyrics of “My Adidas” in my head. Paired with my New Balance sneakers was my favorite. I wore this the rest of the day – so comfortable! So here’s the before and after. 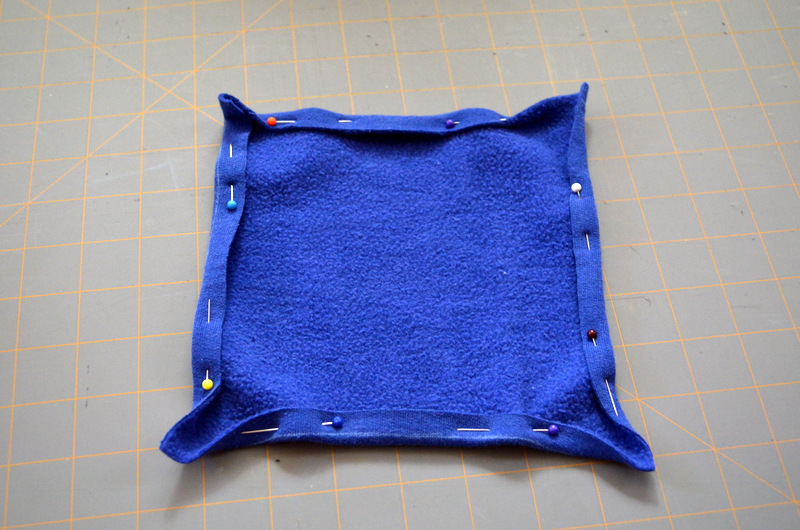 It was a really quick project – not sure why it took me so long to get started on it. Promise it won’t be that long until the next installment of Sweatshirt 2.0. Because I hear this summer in Northern California is going to be CRAZY. 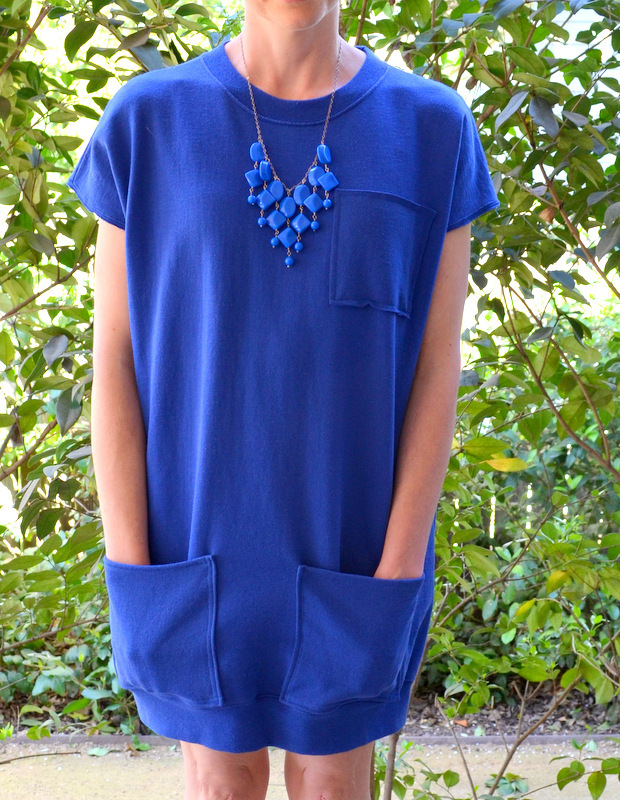 I’ve got to finish up my sweatshirt projects before the real heat starts! 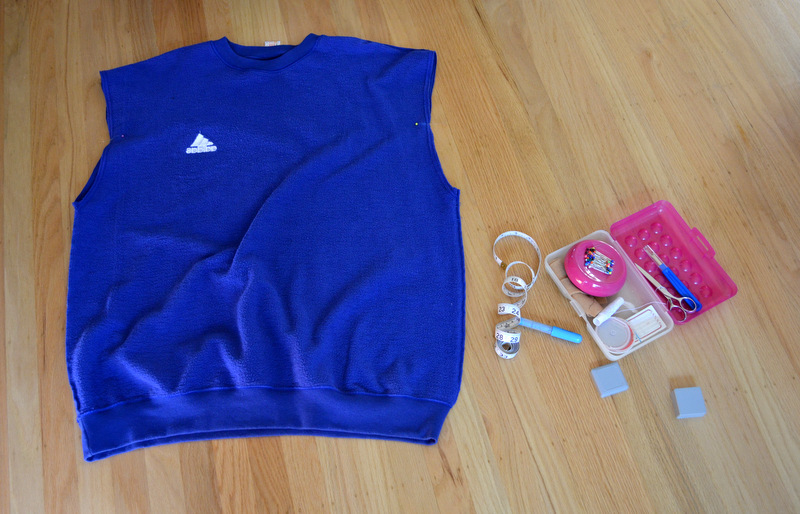 OK, your turn – have you ever remade a sweatshirt into something else? Or is there something you’d like to see me try? I’ve got a few more sweatshirts in my stash that I don’t have earmarked for a project yet. Let me know! You are so good. I like this. Oh snap!! I love this!! Seriously, I couldn’t tell from the first picture that you had made it! Awesome!! Thank you! That’s the best compliment ever!